A historic Dutch schoolhouse gets a residential redesign by Standard Studio. The old classroom space is now an open-concept living and family room. With a family of five and limited interior space, creative storage solutions were essential to the functionality of the home. Simple birch plywood built-in storage under the stairs provides a place to stash kids’ toys, as well as a platform for playing and sitting. Concrete floors flow through the entire home. Once a teacher’s lounge, the master bedroom now occupies the first-floor space. A hot rolled steel staircase leads to the lofted second-floor, an addition which brought more livable square footage to the overall program. The kitchen is completely open to the main living area and features a custom birch pegboard wall. Eames dining chairs accent the space. The loft addition afforded space for a home office and music area. The family chose to forego a dedicated office upstairs, instead prioritizing private bedrooms for each of the children. Shelving and a built-in desk anchor the loft’s far wall. Another former teacher’s lounge was converted into a kid's bedroom. For consistency, simple plywood, lightly coated with lacquer, was used for custom furniture and shelving. The main hallway and corridor leading to the apartment was kept all-original; the entrance appears just as it did 100 years ago. The interior offers a warm and modern respite, while respecting the colorful history of the schoolhouse. For an active family of five in Amsterdam, this century-old schoolhouse building was given a second life when it was transformed into an open-plan family dwelling. 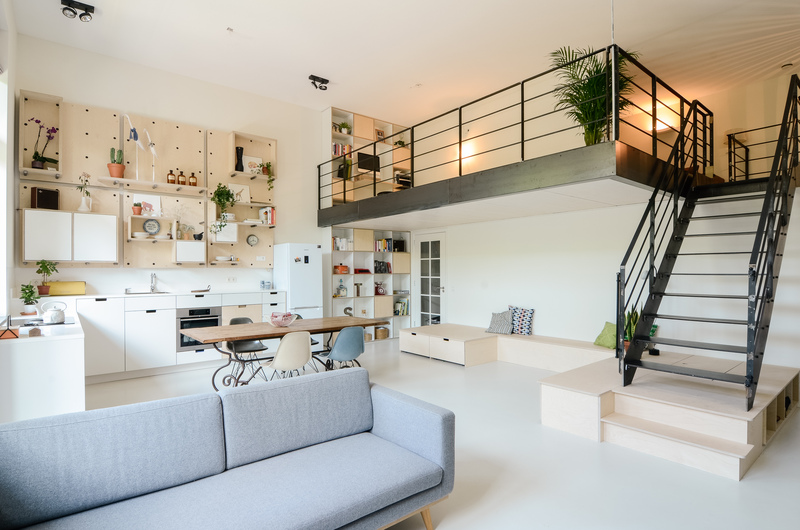 First the school was converted into 10 apartments by Casa Architecten, then Amsterdam-based Standard Studio was hired to tackle the interior design of one of the individual apartments. Throughout the space, simple and industrial materials were favored, a nod to the original utilitarian function of the space.